We deliver Monday through Friday 7am to 5pm, and till noon on Saturday. We try to accommodate every am delivery or pm delivery request. Do I need to be home to accept delivery? No, you can leave written instructions on the front door, and or written notes on the delivery page. Our drivers are instructed to go to the front door in absence of delivery notes. Can you call before delivery? Our drivers are instructed to keep in communication, and call with an estimated time of arrival. This is why we ask for a couple of phone numbers. Will you deliver off the pavement? This is very risky, and can cause severe damage to your property. If the ground is soft, the truck may get stuck, causing damage to personal property. The sides of an asphalt driveway can be crushed, when leaving the safety of a paved surface. The professional driver may have to make this judgement call at the time of delivery. In general, it is safer for everyone to have the trucks delivering on pavement. Do you deliver when it rains? It is almost inevitable that when you are ready for your order, there will be some kind of precipitation event. It never fails. We deliver in the rain. It does not hurt our products, they are stored out side to begin with. Plus, the sooner you have them on site, the quicker you can get started, when Mother Nature finishes. 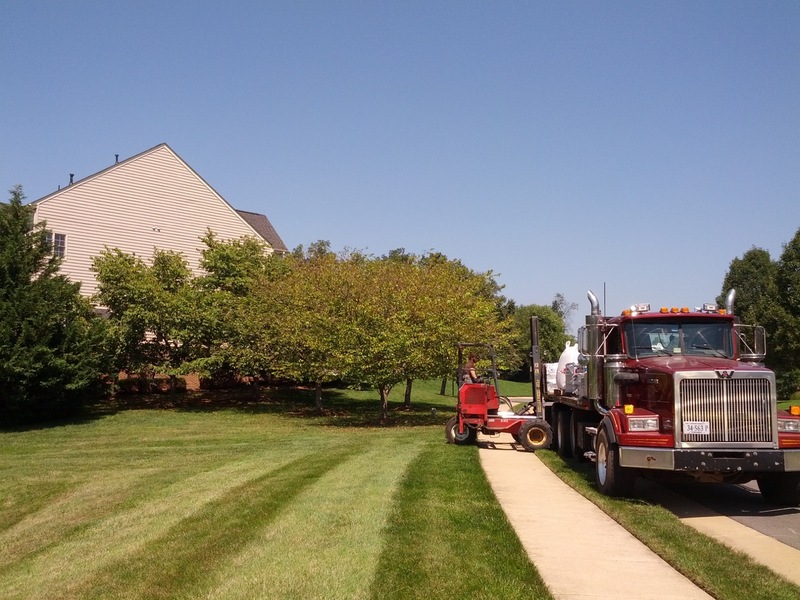 JK Enterprise Landscape Supply provides Commercial and Residential delivery throughout the Washington, DC metropolitan area for all of our products. Bulk materials such as aggregates, stones, topsoil, and mulches are usually delivered in dump trucks. The size of the truck used for delivery depends upon the quantity ordered. We can accommodate any quantity request, with some minimum requirements. Standard delivery quantity for mulches is usually in the 10-30 cubic yard range, delivered in a single axle or tri-axle dump truck. We can also deliver up to 85 cubic yards by tractor trailer or walking floors. Topsoil blends and heavier bulk aggregates are usually delivered in tri-axle dump trucks in 7-20 cubic yards or 7-20 ton loads. Here are just a few popular delivery areas. Note that we deliver all across Northern Virginia and points west and south and even into Maryland and DC! Bagged products and natural stones are usually delivered on a pallet using a flatbed truck with a forklift on the back. The palletized materials are offloaded with the forklift and placed on a hard surface. Standard delivery is usually one or more pallets of landscape materials.